Within MARLISCO the educational material “Know Feel Act! To Stop Marine Litter” has been prepared to inform, sensitise and enable European teachers and students to take action to tackle the problem of litter in our seas and coasts. The material has been designed to primarily serve youth aged 10-15 yrs, but can be used also by educators outside the formal schooling system. This is a joint product of the MARLISCO consortium and within the project duration (2012-2015) it will be translated and applied in the 15 partner countries. Within the MARLISCO project the material is solely shared in its electronic form (but partners are welcome to raise additional funds to produce it in hardcopies!). The material contains 17 activities, each combining a learning activity part (4 pages) and a worksheet for students (1 page). The activities are self-standing and can be applied separately or combined in clusters, so to meet the needs of the educator. Citation: Alampei Iro, Malotidi Vicky, Vlachogianni Thomie & Scoullos Michael, “Know, Feel, Act! 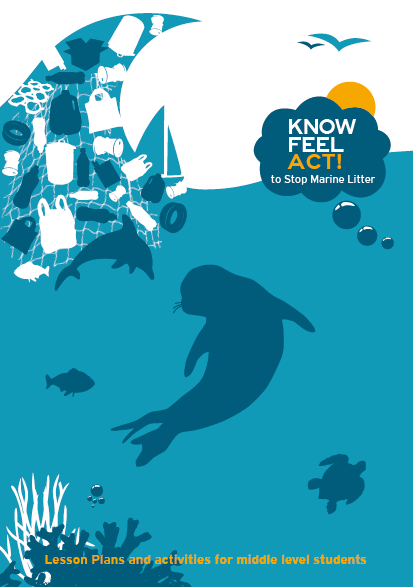 to Stop Marine Litter: Lesson plans and activities for middle school learners” © MIO-ECSDE, 2014. Special thanks to all MARLISCO partners that enriched the material with their ideas, especially Luigi Alcaro, Flávia Silva, Demetra Orthodoxou, Tom Doyle, Damien Haberlin, Kathrin Kopke, Joana Veiga, Isabelle Poitou, Ryan Metcalfe and Bonny Hartley. Sincere thanks to Richard Thompson for his valuable evaluation comments. ARABIC VERSION (May 2015): UNEP/MAP through the EcAp-MED project co-funded by the EU and the Mediterranean Trust Fund of the Barcelona Convention adapted, translated and printed this educational material into Arabic for distribution in many countries of the Mediterranean sea. SECTION A: GETTING TO KNOW MARINE LITTER. In this activity learners familiarise themselves with marine litter by playing classification and description games. They brainstorm ideas on the concept of “litter” and discover that objects disposed of improperly, may end up as marine litter. In this activity, learners experiment with litter items and test some of their characteristics and effects on the environment. Learners investigate the degradation time of various materials and the role of weather conditions on the degradation process. In this activity, learners use diagrams, local and global maps in order to illustrate the point that marine litter items continue “travelling” from place to place, creating a problem of global dimensions, with no borders. In this activity, learners work in groups to guess litter items most commonly found on beaches. They compare their assumptions to published data from national or international research or to real data recorded through their own field research. They reflect on specific consumption habits that generate marine litter and think about how changes in these behaviours can prevent its generation. In this activity, learners observe, record and classify litter found in their immediate surroundings. They reflect on how this litter found its way there, how it can make its way to the marine environment and how to prevent this from happening. In this activity learners study the most commonly found marine litter items according to their origin and types of activities that generate them. They study data, make graphs and discover how our collective trash becomes marine litter. In this activity, learners work on one or more press articles related to marine litter. They analyse the causes, and think about the actors involved in terms of their responsibilities, values and benefits including possible ways of addressing the problem. In this activity, learners read the findings of published surveys on the general public’s opinions on various issues relating to marine litter. They then prepare and conduct their own survey of local residents from their school area so as to identify perceptions, attitudes and behaviours related to marine litter. In this activity, learners “experience” what marine animals may feel when entangled in litter items. The activity can serve as a stimulus for further exploration on ingestion and entanglement and the threats they pose to marine life. In this activity learners simulate reactions of certain marine animals that come into contact with litter items. Learners listen to descriptions of each marine animal’s characteristics and then try to identify the type of litter that may harm them. C3 How Harmful is It? In this activity, learners estimate how harmful certain marine litter items are based on their perceptions. Learners express their personal views and work towards reaching a class consensus. They then compare these outcomes with the relevant literature on the impact of marine litter on animals and humans. C4 Can we Afford Marine Litter? In this activity, learners work on a given case study presenting the economic implications of marine litter and analyse these implications taking into account a list of related parameters. In this activity, learners are introduced to international efforts focused on fighting marine litter and pollution in general. They conduct research on major policy tools for the protection of the Regional Seas of Europe and study basic information including the aims of conventions and strategies, involved countries, targeted ecosystems, milestones and activities. In this activity learners focus on a nearby natural site -a coast, wetland, etc.- that is important to them and envision how they would like this site to be in the future. They do not only reflect on the “envisioned” (desired, ideal) future of the site, but also on their role in shaping it. With this activity learners are encouraged to take ownership and responsibility for their behaviours and actions. In this activity, learners reflect on what may keep them from acting in a more environmentally responsible manner. They identify their reasons and personal motives and think about the best way to overcome these barriers. Afterwards, they commit to a “greener” routine for a set period of time and monitor their new habits. In this activity learners organise a clean up project in their local area in collaboration with the municipal or state agency responsible for the site. Learners will ‘adopt’ this site and seek to inform the local community on the impact of marine litter and how to keep the site clean. In this activity, learners analyse visual messages of environmental campaigns and gain insights into how visual means are constructed to influence behaviour and decision making. Furthermore, they design and organise their own awareness-raising campaign or event in their municipality, school or local beach, etc. Exrra Literature: Interested educators may find useful also this list of open free to download teaching and learning resources targeted in teaching about marine litter. Acess list in Exhel.